We are off again on our fourth Fund Raising Ride!! This year’s event is going to be the most successful yet and already we have a number of riders signed up….!!! So don’t hang about, DOWNLOAD AND COMPLETE THE REGISTRATION FORM NOW AND SECURE YOUR PLACE ON THE RIDE! Cycling through the beautiful countryside of France, the spiritual home of cycling. 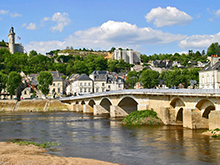 Please join us on this fantastic, fun adventure, cycling approximately 300 miles in 3 days through the beautiful Loire Valley from Orleans via historic towns such as Blois, Chinon, Saumer and finishing in Angers. The route has been designed to make this trip a fun yet challenging 3-day adventure. It remains accessible to riders of all abilities and ages (over 16) as long as there is a basic level of fitness. Those of you who participated on previous cycle challenges will remember our professional cyclist and guide; Phil ‘NO GEARS’ Deeker. I’m delighted to announce that Phil has agreed to lead his support team for a fourth consecutive challenge during our quest in France this year. Phil and Simon have recently travelled and planned the route between Orleans and Angers and it will be an extraordinary ride across some of the most beautiful countryside in the world with spectacular views throughout. Compared to the previous SGBTF Challenges, in France, Ireland and Belgium, this is perhaps less severe and may appeal to those who were previously intimidated by the routes. The challenge of this route is in the overall distance; there is little climbing, the longest haul upwards is short. But this will still represent a major achievement as riding 300 miles in three days will require some proper training. But training should be focused on endurance, rather than climbing. Aspiring riders will need to gradually increase the distance they ride on weekends, without increasing the actual difficulty of the riding. Each stage features quiet, almost traffic-free roads with 25 mile sections in between roadside feed-stops. 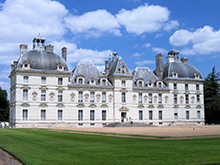 Wherever possible these feed-stops are located near Chateaux, so riders will have moments to admire and soak up the atmosphere of these exceptional buildings.